Old liquid measure, which was mainly used for wine. Originally it meant as much as cargo or cargo of a two-horse carriage. However, the measure was also used for many other products such as hay, ore, coal or as a meadow measure (area that provided a foot, or a hay haul). As a measure of wine there were large regional differences between about 800 to 1,800 liters. 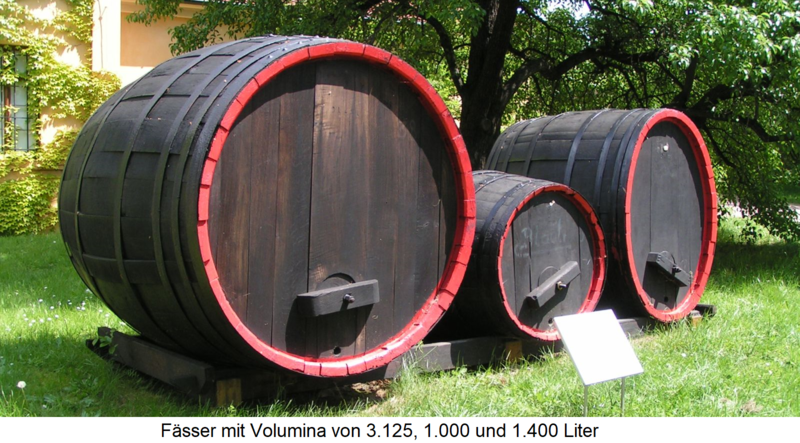 Today, this is still used in Germany Weinfasstype with a volume of 900 liters (Francs), 960 liters (Moselle), 1,000 liters (Rheinpfalz) or 1,500 liters (Baden). In different sources, however, other values ​​are mentioned as in the picture. That in the French Alsace used Foudre corresponds mutatis mutandis to the Fuder and similar volumes are also available piece, Regarding name and volume, there are hardly any wine law requirements. See also below barrel. drum types. capacity measures and wine vessels with lists of relevant keywords. This page was last modified at 11 November 2018 at 17:06.